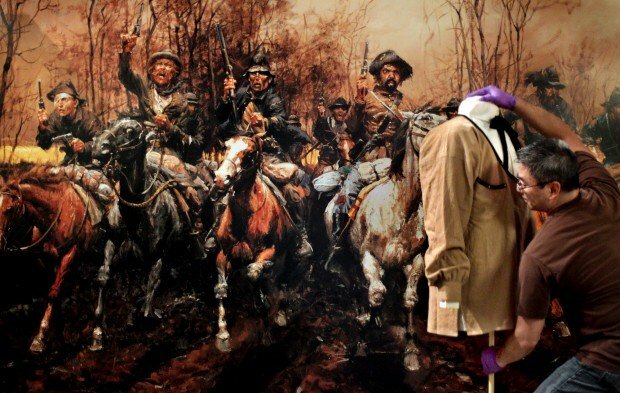 ST. LOUIS • The Missouri History Museum's special exhibit on the Civil War opens this weekend with old artifacts and fast-moving interactive panels depicting this state's own convulsive, bloody divisions. The exhibit is the museum's contribution to a four-year national commemoration of the Civil War's 150th anniversary. Missouri, a slave state, shakily remained in the Union. But it was deeply divided by sentiments that played out in harsh social conflict and brutal guerrilla warfare. The exhibit runs through March 2013. It is in the museum's main building in Forest Park, at Lindell Boulevard and DeBaliviere Avenue. Spread across 6,000 square feet of floor space are 187 artifacts, 251 images, 56 storyboards of explanatory text and 12 touch-screen panels. The images include old drawings, portraits, maps and original documents. At the entrance, a jumbo TV screen cycles through the portraits and conflicting thoughts of 12 Missourians, six from each side, as war began. They include Jessie Benton Fremont, the influential and ardently Unionist senator's daughter and general's wife; and Sterling Price, a former governor who joined the rebel army. "In Massachusetts and Mississippi, nearly everyone agreed with their state's stand," said Jeff Meyer, chief curator for the exhibit. "In Missouri, there were people enthusiastic for the Union or strongly sympathetic to the South. A lot of others were caught in the middle. Some just wanted to be left alone. The conflict was pervasive, and it never really ended. "That's the tale we want to tell." 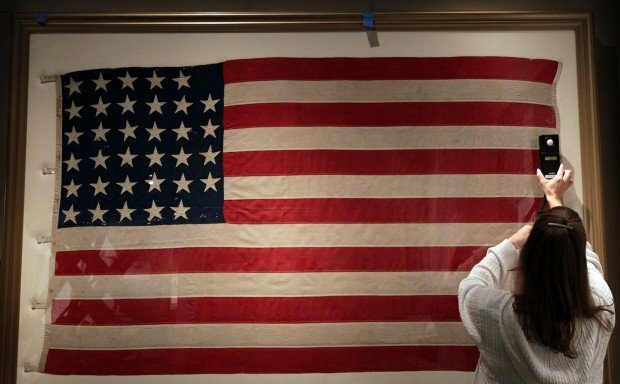 Most of the artifacts, such as flags, surgical kits and uniforms, are from the museum's collection, with others on loan. Back on display are some of the swords and firearms that once graced a balcony of the Jefferson Memorial, the older part of the museum building. 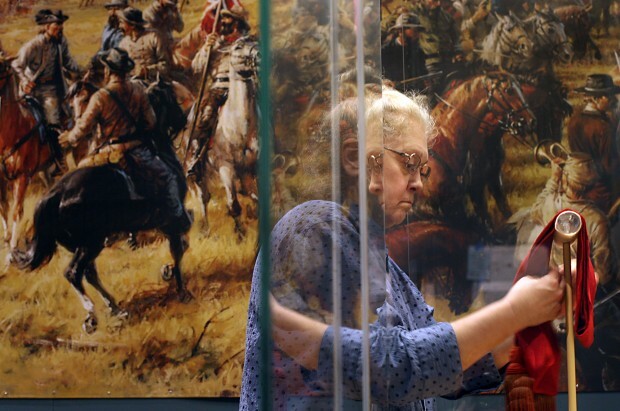 The exhibit includes infantry muskets, cavalry pistols and a sawed-off shotgun, the sort of nasty weapon used in the many skirmishes between local Union militias and homegrown Confederate guerrillas, known as bushwhackers. Meyer said museum employees "get asked about the old guns all the time. You can see some of them again." The exhibit is divided into six subjects as it winds through the war's origin, four years of fighting and conflicted aftermath. Much of it covers St. Louis, a vital Union stronghold and scene of early bloodshed. But it also depicts slavery, life and violence across the state. Almost 10 percent of Missouri's pre-war population of 1.2 million were slaves. St. Louis, settled by slaveholding French colonials, evolved into a marginally pro-Union city by 1861 through northern-leaning industrial growth and the arrival of antislavery German immigrants. Among artifacts tracing those changes are the "rules" of Bernard Lynch's slave pen downtown and items raffled at the Mississippi Valley Sanitary Fair of 1864, an event organized by prominent St. Louis Union women that raised money for medical care of soldiers. • A regimental flag from the Southern-leaning militia gathering in May 1861 at Camp Jackson, near Lindell and Olive boulevards, shortly before the city's first deadly street battle. • The shattered pocket watch of rebel Col. Austin Standish of Missouri. The timepiece saved him from a musket ball at the battle of Wilson's Creek, near Springfield, Mo., in August 1861. • The uniform jacket of Union Capt. Henry Kircher of Belleville, later elected St. Clair County circuit clerk. The right sleeve is pinned to the shoulder, befitting his loss of an arm. • Discharge papers of private Elijah Madison, one of Missouri's black Union soldiers. • The original of Missouri's formal act abolishing slavery on Jan. 11, 1865. One of the exhibit's touch-pad panels allows viewers to trace the movements of 12 Missouri military units, six from each side, as they move across the war's far-flung theaters. Almost one third of Missouri's 150,000 men in uniform joined the Confederacy. When a viewer shows all 12 meandering paths, the image on the screen is of tossed spaghetti.